Swimming Armbands for Kids and Toddlers - Good or Bad? Swimming armbands are probably the most popular and most commonly used swimming aid for young children and toddlers alike. 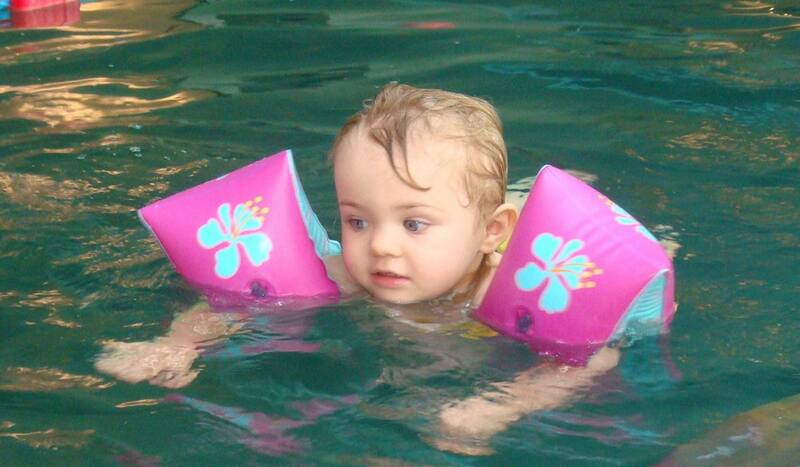 Armbands are very cheap and very durable floatation aids that are ideal for assisting young children in the early stages of learning to swim. They help to keep kids afloat in the water whilst at the same time give them a sense of freedom, allowing them to kick and move about the pool independently. Although they can be restrictive to the movement of their arms, they keep a child close to the surface of the water. This allows them to experience blowing bubbles in the water and any splashing sensations, all of which are vital parts of the learning to swim process. Develop early confidence - great for boosting the water confidence of young children and giving them a sense of freedom in the pool. Buoyancy level can be adjusted - the amount of assistance provided by armbands can be reduced by gradual deflation as the non-swimmer becomes stronger and more confident. Co-ordination can be enhanced and improved as a child's arms and legs can be used independently. A larger number of swimmers can be safely supervised, making armbands ideal for large group swimming lessons. Swimmers can become dependant on armbands - some children find it difficult to change to a different swimming aid and as a result they lack progress. This commonly occurs in the presence of their parents and it usually takes a professional swimming teacher to gain significant progress. Can restrict movement - The nature of how they are fitted on the arms, armbands can be restrictive and may hinder arm movement, especially in smaller children. May not provide enough buoyancy if used by adults. Ideally armbands are to be used only by children. Now that you have read about the pros and cons of using swim armbands on children and toddlers, you have come to your own conclusions and are now looking for where to buy them. Click the link below to find your local buying options. Click here to get directed to the best place to buy from.